And if you don’t have the Namecoin wallet, Get the installer HERE After installing, make sure you’re connected to the Internet and allow the wallet to sit running for 3-5 hours until it’s totally updated. MeowBit will NOT work without the updated wallet running. After March 14th, 2014, read this to check if you have the latest version: Update Alerts Over the Blockchain – a new feature for all blockchains. You need to have the Namecoin WALLET installed and updated. Start Namecoin wallet. Let it update. NOTE: You have to have the Namecoin wallet running while running MeowBit in order to be able to use Dot-Bit websites. 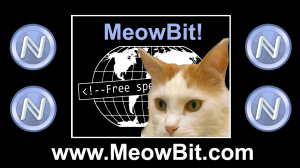 (If you’re on Linux, please use FreeSpeechMe instead of MeowBit, though FreeSpeechMe only works on Firefox. 2017: FreeSpeechMe no longer works. Change in Firefox API, and main Namecoin dev never fixed it (!). The link to the MeowBit install file is lower down the page, after some important info you’ll need to know. PLEASE READ ALL INSTRUCTIONS BEFORE INSTALLING. We haven’t heard of any issues, but if you have any Namecoin in your wallet, be SURE to back it up to another hard drive or computer before installing anything that interacts directly with the wallet. 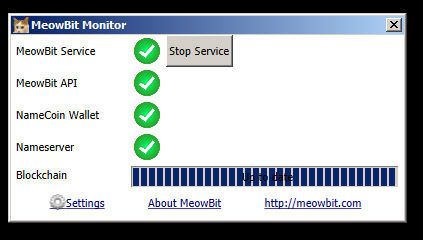 If you were viewing Dot-Bit domains before using the clunky and insecure alternate-DNS servers workaround, change back to your old default DNS servers before installing MeowBit. Disable (or disable and remove) FreeSpeechMe if you have it installed as a plug-in in Firefox. Restart Firefox. You should NOT be able to surf dot-bit addresses. Close Firefox and any other browsers. Depending on your firewall settings, you may get no request, you may get one request, or you may get several such requests in a row, one right after the other, or a few moments apart, for several components of the Namecoin wallet and/or MeowBit. You will have to click “Allow Access” for each one you get. 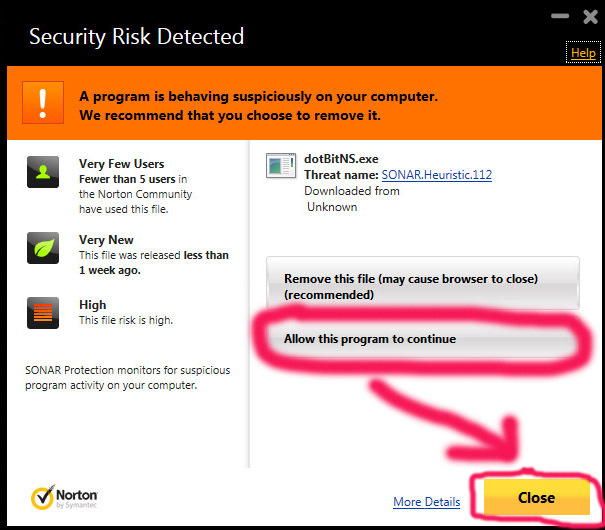 If a Windows firewall warning for any of these components ever comes up again, click “Allow Access” again. 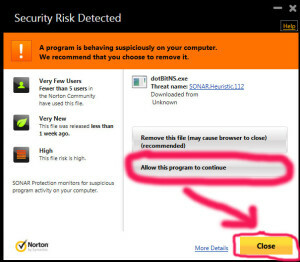 In Windows 8, it will likely be the User Account Control instead of Windows Firewall. Hit the “Yes” button to allow. You have to have the Namecoin wallet running while running MeowBit in order to be able to use Dot-Bit websites. 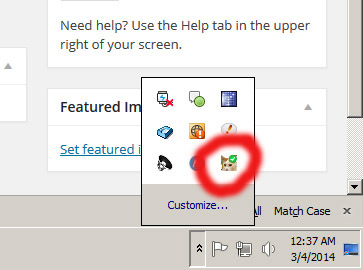 You may have variations of blue and red icons, but none will be green immediately. If “Install Service” button appears, then press that button. If “Start Service” button appears, then press that button. http://www.derrickslopey4towncouncil.bit Dot-Bit-only site of our programmer, who is running for Town Council in Orono, Maine. Here’s a page with a long list of more to try. They may not all work (they aren’t always all up) but if some of them work, MeowBit is working. 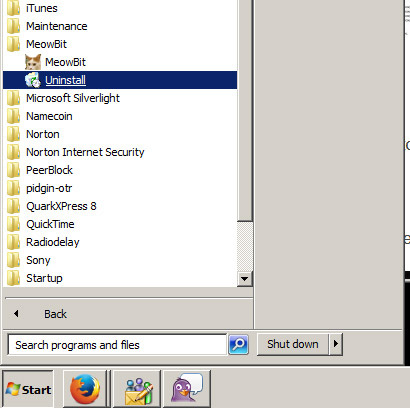 You can now delete the installer file from your desktop, unless you want to install MeowBit on more computers. All of these will open the program interface. –If you have trouble getting the Namecoin wallet to connect on a new installation of windows; if it seems stuck and won’t update, close the wallet, reboot your computer and restart the wallet, then it should begin updating. Please leave a clear and detailed comment on our help forum if you have any issues with any aspect of running MeowBit. We like bug reports. –the text in latest log file. 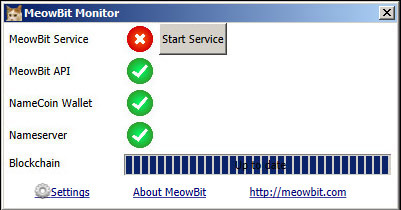 You can get the log file by clicking on the Kitty icon on the desktop to open the MeowBit Monitor, then click Settings in the lower left, then tick mark Enable Logging, then click Copy Latest Log. NOTE: There may be personal info in the logs (i.p. address, operating system, sites you visited, etc. ), but unlike the NSA and your ISP, we WILL delete them as soon as we’re done analyzing them. Unless you post them on our forum, which we do encourage, as we can group-source solutions. And just tell us how it works on your end please. But we also like to hear from you when things go well and if you enjoy MeowBit! Comments aren’t just for bug reports! 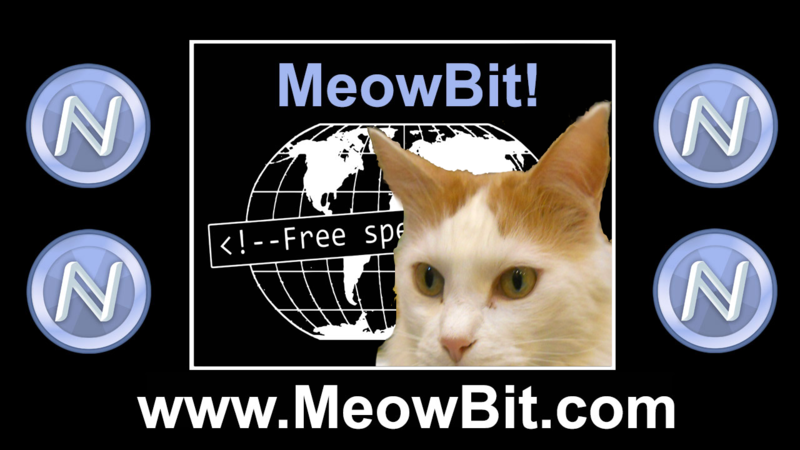 And if you enjoy MeowBit, please, TELL TWO FRIENDS! NOTE: You’ll want to un-tick “Enable Logging” after you solve your issues, because the logs are extensive and will fill up space pretty fast. If you get a message that says “Namecoin config updated. restart wallet”, restart wallet and wait a few minutes. It can take 7-10 minutes to fully open. A new wallet is coming soon that will take MUCH less time to open. And it also has to update. That amount of time will depend on how long since your last update. You’ll get a green check mark in the bottom right of the wallet when it’s fully updated. You may have to be patient the first time or two. If after ten minutes you have green lights but cannot surf Dot-Bot, reboot your browser, or close your browser, open another browser and try it. It can take several minutes after rebooting to have connections, or even to have the wallet online (indicated by a green check mark in the lower right of the wallet.) There is a planned update to the wallet to make it much faster. If your local network (LAN) is running IPv6 or if you have “Internet accelerator” apps that may emulate IPv6, you may have trouble getting on Dot-Bit at all. We are looking into this and will put up a blog post, and add the info here, when we find out. A temporary fix might be disabling IPv6 in your router or on your network adapter. Future version of MeowBit should not have this issue. 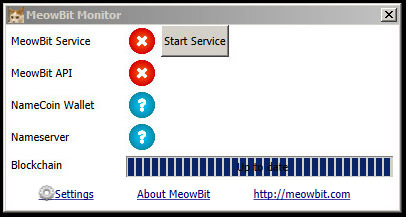 MeowBit may not work if you have Windows hotspot sharing enabled. Effecting MeowBit versions through v 0.4.5189.20512: If your Namecoin wallet data is in a custom location, MeowBit will not work. This issue will be fixed in the next version. Right-click the connection that you want to change, and then click Properties. If you’re prompted for an administrator password or confirmation, type the password or provide confirmation. Click the Networking tab. Under This connection uses the following items, single-click Internet Protocol Version 4 (TCP/IPv4), and then click Properties.” Set to “Detect Automatically” and hit Save” and exit. THANK YOU FOR TRYING MeowBit. Please consider donating to us (That will get you on the The Golden Blockchain of Redemption! ), and also registering your own Dot-Bit domain and starting your own Dot-Bit website. And tell two friends about MeowBit! 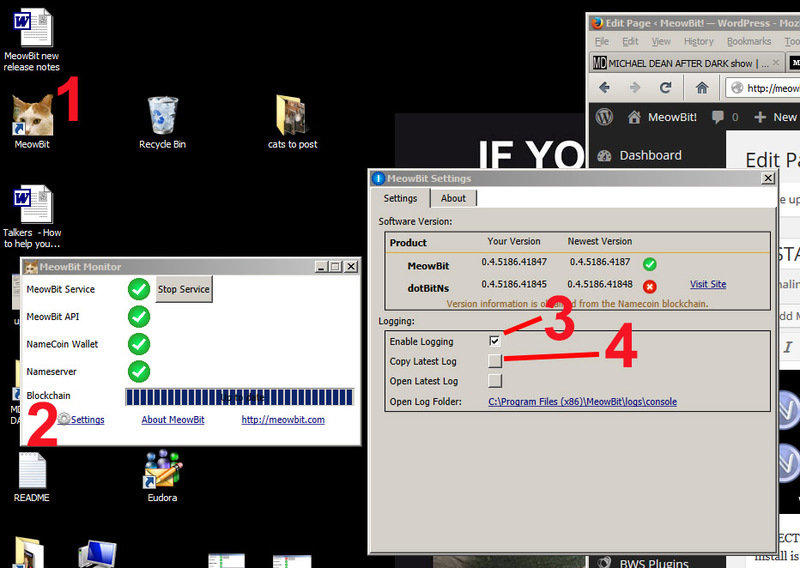 Or you can use the Windows uninstaller: Control Panel / Programs and Features / MeowBit, and uninstall. Then go back to navigating the Central Scrutinizer-controlled old-timey web the way Thomas Jefferson did. Pingback: New version of MeowBit out now. v0.3.5179.694 » MeowBit! Get us an Ubuntu and Mac release!!! 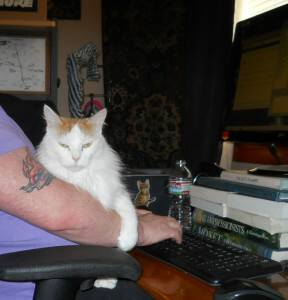 Pingback: MeowBit, now for XP as well as Windows 7 and 8. View Dot-Bit (Namecoin) domains system wide! | MeowBit! Pingback: MeowBit version 0.5.5204.40235 is out now! | MeowBit! Just heard about the .bit thing and think it seems good. Do you know if there is a linux distribution that has the technology installed from the package so to speak?? Help! I have installed the namecoin wallet, and the meowbit software on 27/11/2014 but the dns stays red. Both the namecoin and meowbit have been running for at least 24 hours. How do I fix this? He should know, he’s stone cold FBI.